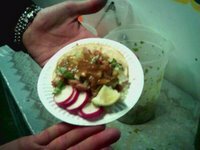 Six moons ago, my pals and I ended a night of head-bopping and booty-shaking with some $1 tacos. It was fitting that we closed the night with some carnitas in Los Angeles' Echo Park neighborhood because we kicked off the nocturnal festivities with a Hollywood concert for a multicultural hard-rock band called Madrepore. The group's half-Mexican singer didn't let his open fly distract him from crooning in Spanish. I can't think of any food that would have complemented the electroclash dancing that followed our rock-out en espanol. But my friend's boa certainly goes well with any midnight snack. 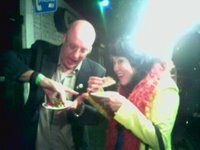 0 Response to "Electroclash Tacos"